Not a lot of people know this, but my hair is stubborn AF. Ever since I got my hair cut, it's been an absolute pain to get it to follow my wishes and orders, so what I did for most of the baby-months of my new hair was just hide it under a beanie or a fedora hat. Not exactly the most fun way to treat new hair, but it was better than spending hours trying to figure out how wax works (it doesn't) and straightening my hair out with an iron (who has time for that?). 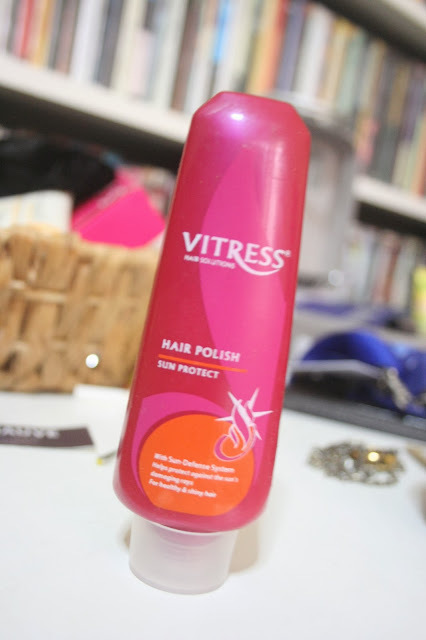 The good news is that I finally found the perfect product to keep my stubborn hair at bay: Vitress hair polish. I swear: just a 1-peso-coin-big blob of this product is enough to destress my mind from worrying about how crappy my hair looks. Ask any of my friends: I bring this shiz with me everywhurr! Yay for Vitress Hair Polish! Aw yeah! Flatter hair FTW!